This article is provided as a courtesy to our customers to help you configure your BlackBerry to work with (mt) Media Temple's hosting solutions. Third-party software cannot be supported directly by (mt) Media Temple. If you have further questions about configuring your BlackBerry device, please visit BlackBerry Smartphone Setup. 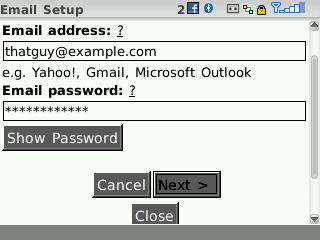 Your email address (e.g., thatguy@example.com) For more information, please read this article: Creating a POP/IMAP email account. Figure 1: This is an example screen capture; your home screen may differ. Figure 2: This is an example screen capture; your home screen may differ. 3. If the information entered was correct, it should show you a 'Success!' message. Once this is done, a new envelope icon will be placed on your BlackBerry front page which allows you to use your e-mail account. See Figure 3. 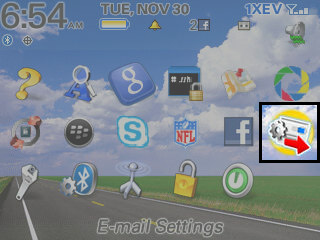 Figure 3: This is an example screen capture; your home screen may differ. 4. Click the Finish button. Congratulations! 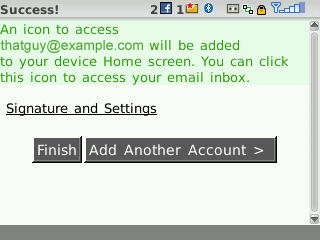 You've successfully added your email account to your BlackBerry device.